SKY LIGHTS – Page 530 – The only good night lights are billions of miles away. There’s a trio of astronomical delights now visible in the east. A constellation, a planet, and a star await your review. Grab a cold one, turn out your lights, go outside, and take a look. The Gemini twins are rising shortly after sunset. 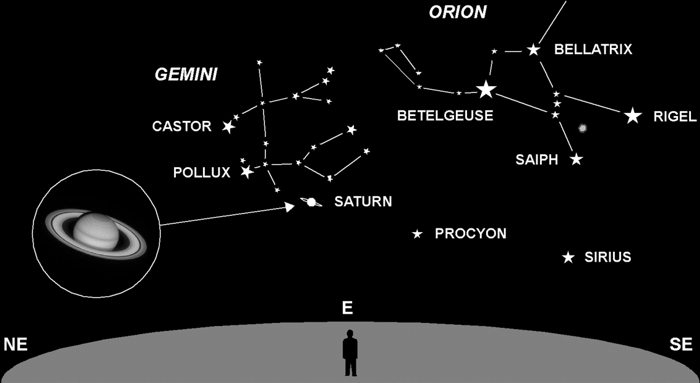 Most of the stars in this constellation are very faint, with only Castor and Pollux, the twins’ heads, easily seen. These two stars are very similar in color and brightness, hence the “twins” designation. Near Pollux you will find the ringed planet Saturn. To the eye it appears as a bright steady dot of yellowish light. Through binoculars you can see a hint of its rings. The insert simulates your view through a telescope under excellent conditions. On January 13th, Saturn was at its closest approach to Earth. South of Saturn, and at about the same elevation, is Sirius, the brightest star in our sky. When it’s low near the horizon it sparkles randomly displaying all the colors of the rainbow. The effect is especially striking when seen with magnification. As light rays from a star penetrate Earth’s atmosphere they will experience refraction, changing their direction, dispersion, and the separation of their colors. The lower and brighter the star, the stronger the effect.